Califone International, Inc. announces the release of the TPT smartphone and tablet stand. The stand displays full- and mini-sized tablets, and larger smartphones, for learners to view in portrait or landscape mode, while using mobile devices for typing. 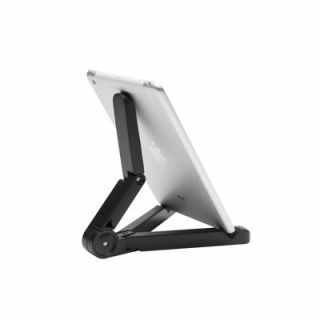 When the TPT tablet stand is opened and adjusted, the stable base with two-part spine can be molded to prop up tablets such as an iPad, Kindle Fire or Galaxy Tab. The three-step, ratcheted, independent movement of each base leg opens to a 75-degree angle, and expands up to six inches tip-to-tip. A 22-step ratcheted movement of the spine (at the base) adjusts vertically from zero to 180 degrees. In addition, the stand features rubber grips to keep devices in place.